My littlest pumpkin is 16 months now and SOOOO ready to get in on our “school” time at home. She’s too young to really follow our tot school plans because 97% of things still end up in her mouth…so my solution? 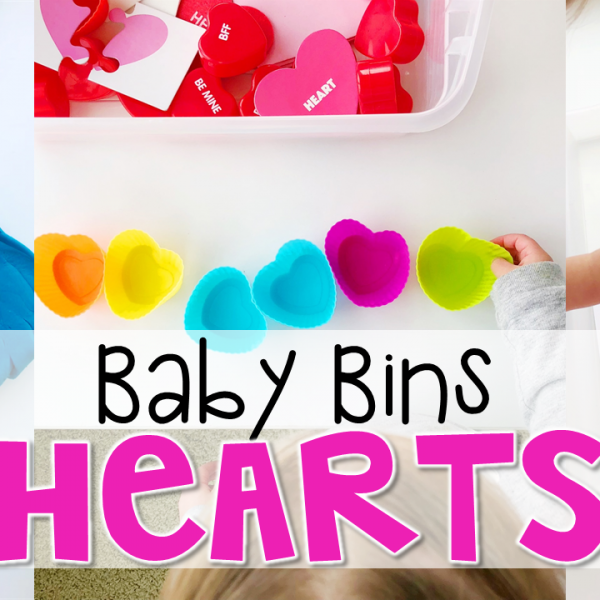 Baby Bins! 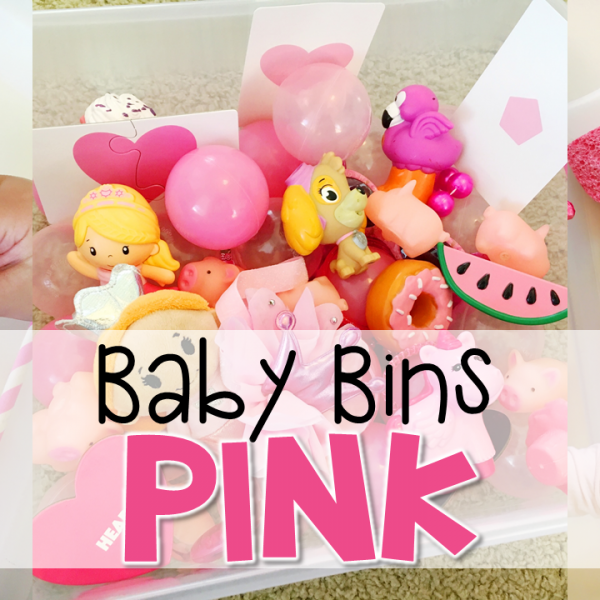 These super simple themes and activities will be designed with the 1-2 year old in mind. 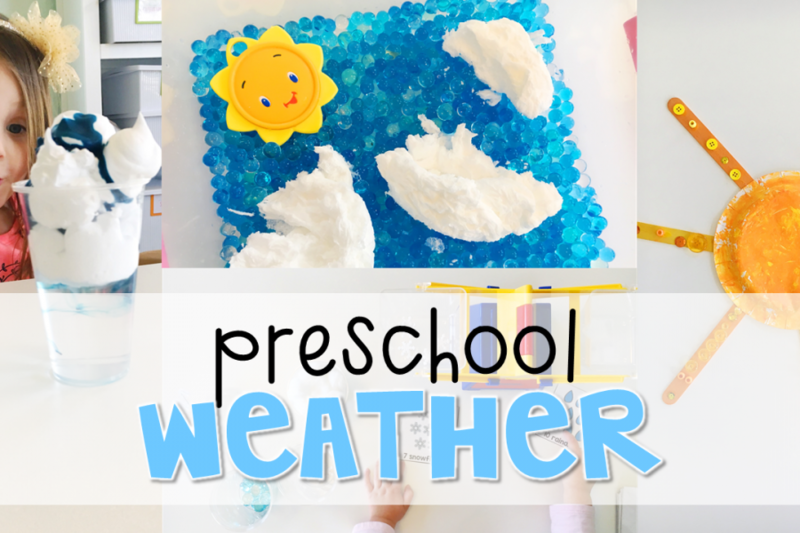 Activities will be quick for those limited attention spans, easy for limited fine motor skills, and taste safe for those kiddos like mine that can’t resist putting everything in their mouth. We are starting each week with a story, then doing one activity a day. 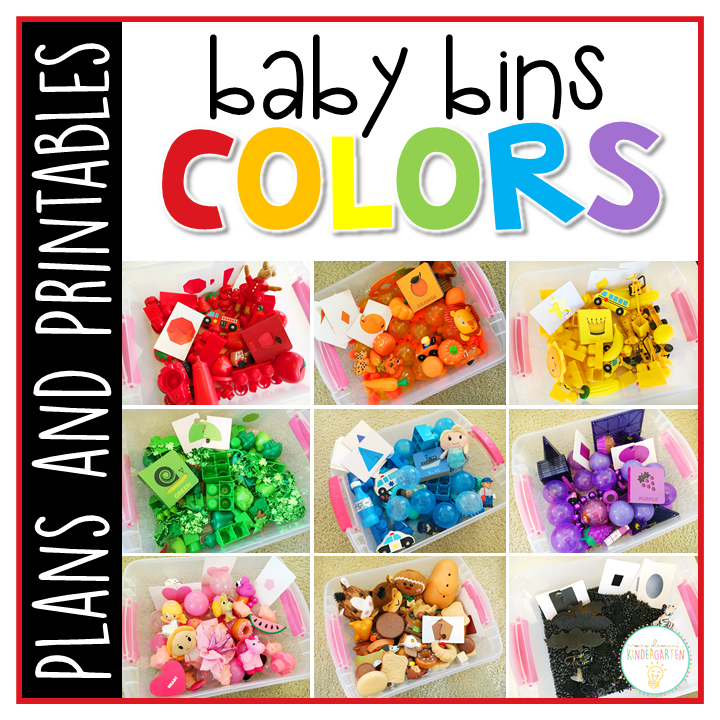 For each color theme, I first put together a sensory bin full of items of that color. Sometimes putting toys together in different ways gives them new life and you’ll be surprised how new and exciting they are again. 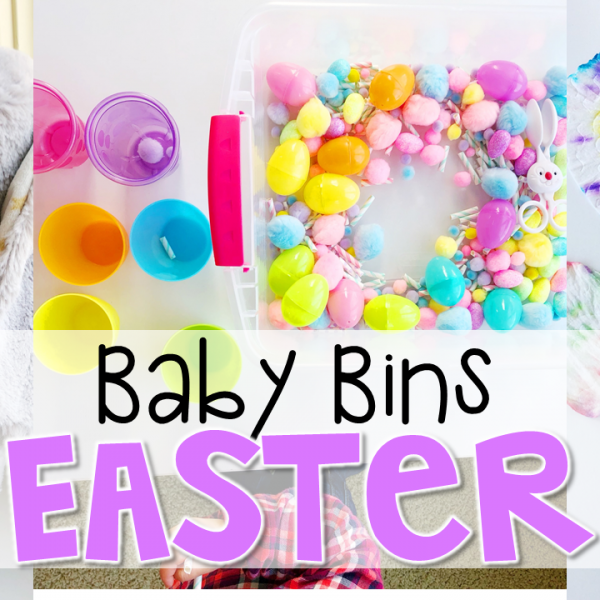 I had my 3 year old help me gather lots of items while Miss Aubrey napped, but you could definitely have your little one help find items to add too! 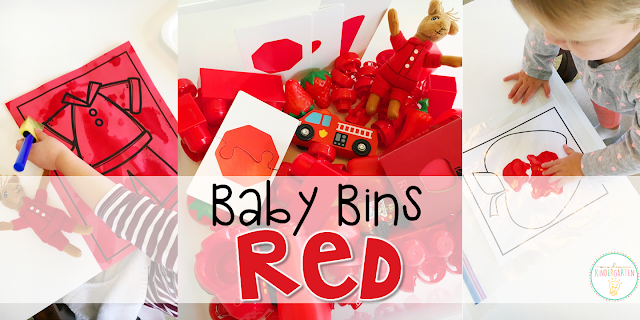 What was in our RED bin? For this activity I drew a large tree outline on contact paper, then taped it to a window sticky side out. Next I gave Aubrey die-cut apples that I found at the dollar tree. You could also use foam apples or paper shapes. These shapes were laminated so they were easy to remove and re-position, which is always a plus since it kept Aubrey busy a bit longer. For this baby safe painting activity, I put an apple outline in a resealable bag with a few drops of red tempera paint. Then I sealed it up for some fun no mess and no stress painting. Before the paint dried I carefully opened the bag and peeled it away from the top to allow it to dry. For another “painting” activity, I printed some jammies on red construction paper and gave Aubrey a brush, a few small sponges and a tray of water. The paper turned a nice dark red as she got it wet giving her the idea of painting without any mess or worry about eating paint. 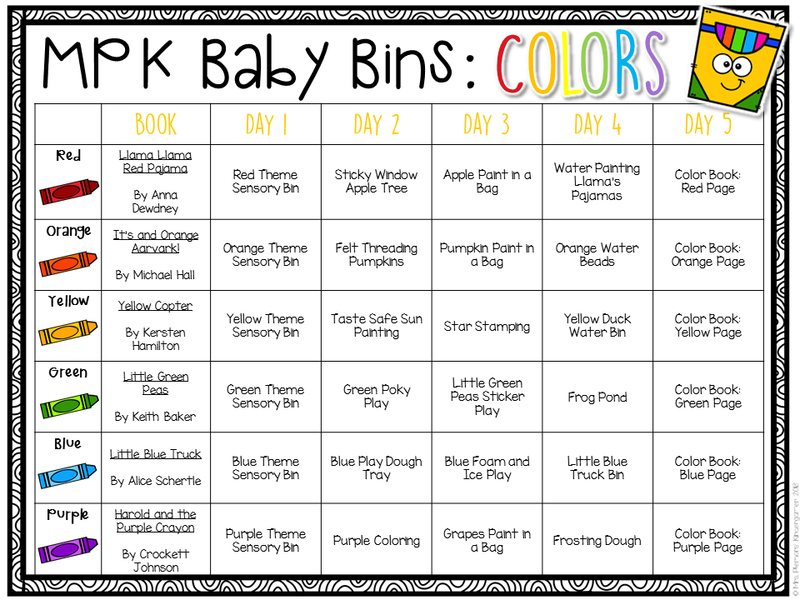 At the end of each color week we plan to make a color collage that I will put together in a book for Aubrey to flip through. To make the red book page, I first cut out a large rectangle from the center of 2 pieces of red cardstock. Then I cut two pieces of contact paper that were slightly bigger than the red rectangles. I took the backing off of one piece of contact paper and stuck one rectangle on it. Then, I gave Aubrey a tray full of red pictures, stickers, sequins, and feathers to create a red collage. After she was finished, I glued the second red rectangle on top of the first and pressed the remaining piece of contact paper over the top to seal the collage inside. Next, I trimmed the excess contact paper around the red rectangle. I hole punched the top corner and added a small metal ring so that I can attach each color page as we finish it to form a unique color flip book. She loves the fun see through pages, and its nice not having to worry about glue and pieces falling off later. 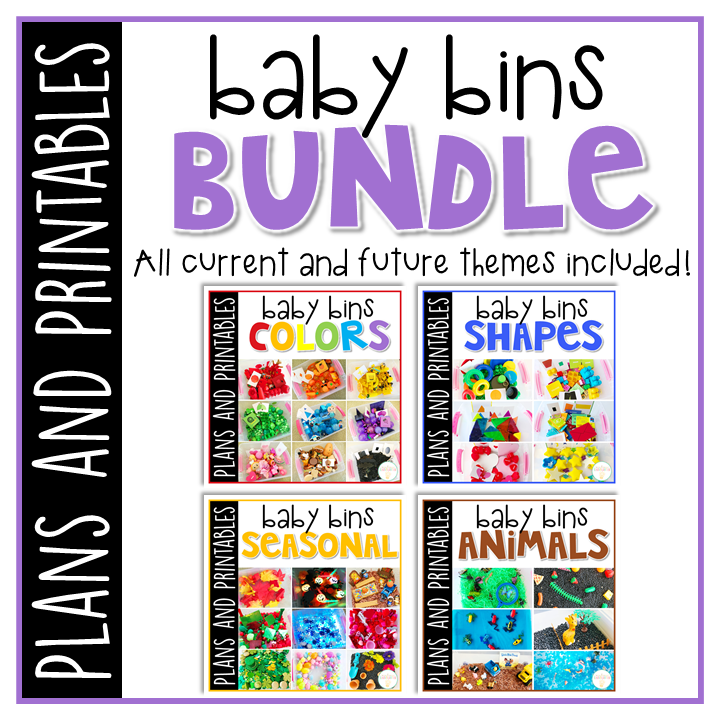 But if you are looking for a quicker version you could also print the red page from our baby bin pack and just use stickers and different coloring tools to create a simpler color book for your little one. Thank you!!!! 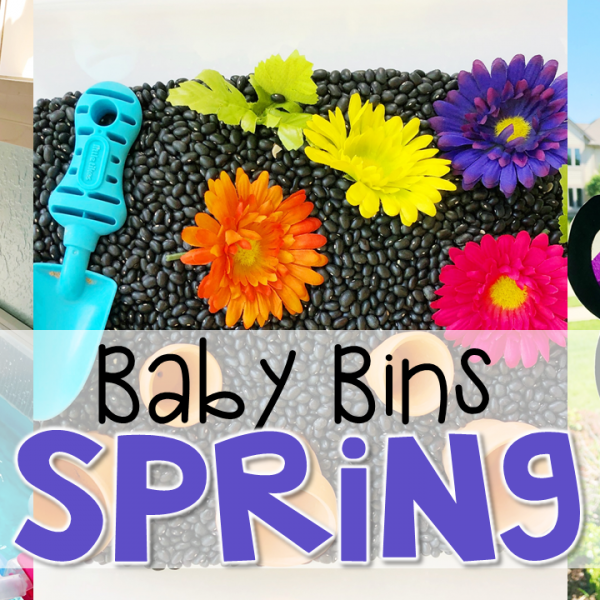 I can't wait to make my 15 month old his own baby bins. I homeschool my 4 year old and he loves to be involved but obviously most lessons don't pertain to him…until now! 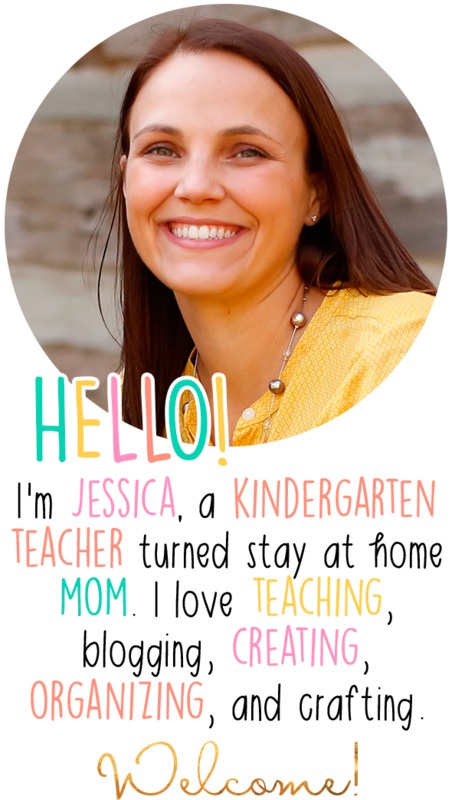 Now that you have two little ones, do you have an updated schedule of what your day to day looks like? I know you had posted one way back when in the Getting Started with Tot School, but I’m assuming life changed a bit with two kids in the mix? I also have 2 kids now and am trying to figure out a routine/schedule that works with both kids’ developmental stages. Thanks!